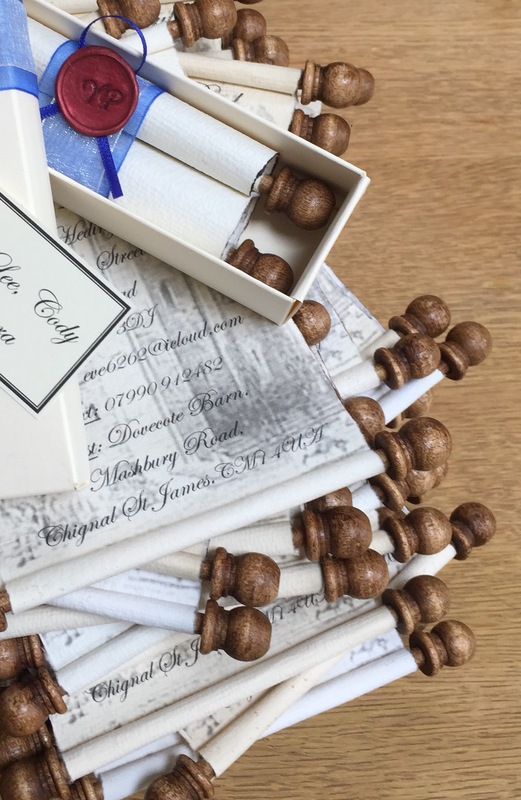 Trinitybox handmade scrolls are perfect for any corporate occasion. They are all unique and personalised, and will ensure that the person who receives the scroll will feel special and valued as they can be tailored exactly to your requirements. 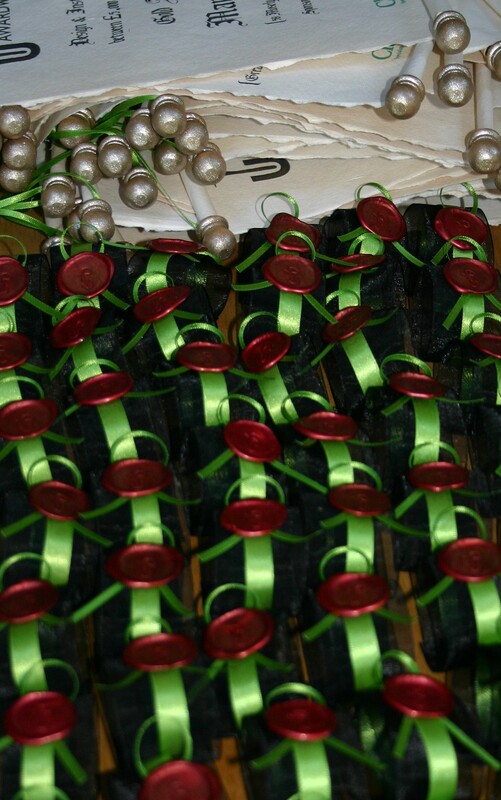 The scrolls pictured above were from the Premium scroll collection (aged scrolls), as the event had a Medieval theme. 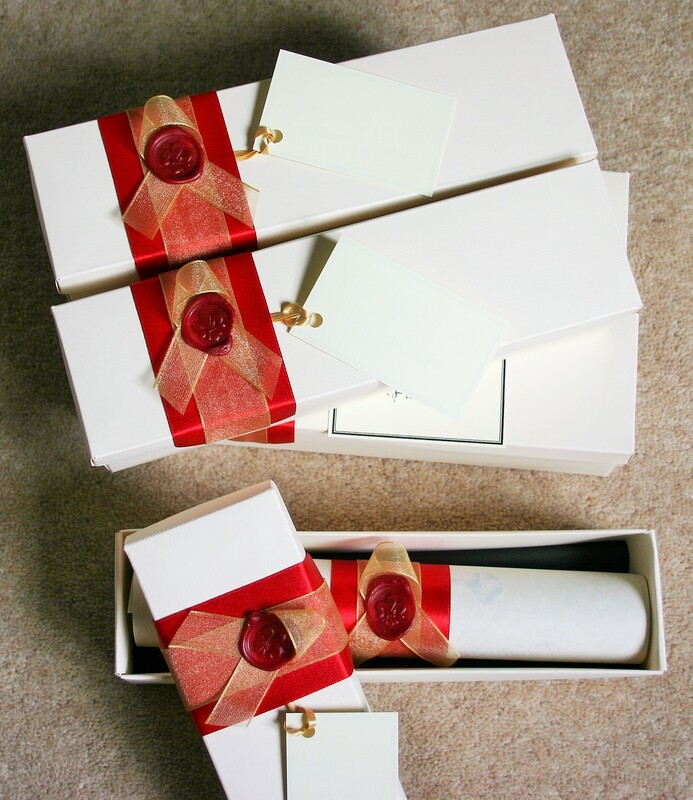 The company also had custom made wax seals with their logo imprinted. This is a direct quote from the company who received the scrolls on the left ‘Oh my goodness I am speechless! They are beautiful! They’ve far exceeded my expectations! Absolutely lovely! Thank you so much!’ I have turned the gift tags around the other way for discretion purposes. 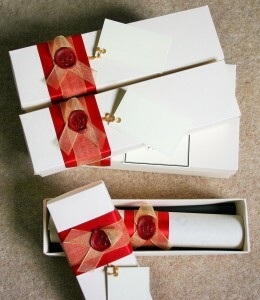 Any message, names, dates, logos, pictures can be incorporated in these scrolls as with my other scrolls. You can choose the colour and type of ribbon used and I can even order unusual charms to tie onto the ribbon around the scroll to complete the overall look you want to achieve. I can also add wax seals in a fleur de lis design, or even a custom design perhaps with your company initials or logo. You can have the scrolls boxed if you like, or you may want them without a box to use in a frame. There is also the option of a hanging scroll for the recipient to hang on their wall. 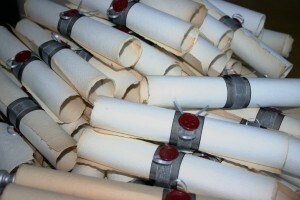 Pictured below are some Certificate scrolls I made for a large phone company. They were presented at an award ceremony. 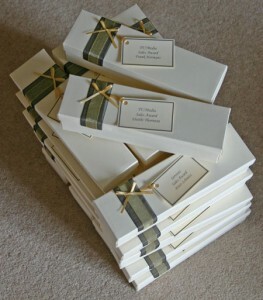 I embellished the font with gold ink on the Certificates, which were then boxed with a personalised gift tag. I can handmake scrolls for all corporate occasions and am always up for a challenge! Please contact me if you have any questions about any of my scrolls. I am very happy to send out a proof to you for a small charge, which would then be deducted from the total order price if you chose to go ahead.